The Loft at Cypress Ridge Estate is set on a 22 acre working vineyard and olive grove, prominently situated atop the ridgeline, with panoramic views of the olive trees, vines and sparkling waters of the Hauraki Gulf – The perfect romantic getaway for two. The light filled, loft-style accommodation is pure luxury and fully equipped to a high specification. Guests enjoy the superior king bed with crisp cotton sheets, plush bathrobes and locally made bath products as well as everything required for a lovely day at the beach. A full self catered breakfast is provided daily consisting of organic eggs, bacon, homemade muesli, yoghurt, fresh fruit, jam and bread along with an assortment of beverages. Come to The Loft and relax, soak in the outdoor bath, curl up in front of the log fire or venture out to explore the estate. Have a walk through the olive grove and vineyard, enjoy the harvest from the large kitchen garden, find fresh eggs in the hen house, tramp through an acre of native bush with several 1000 year old Puriri trees or picnic in the shade of huge Pohutukawas overlooking the neighboring vineyards. 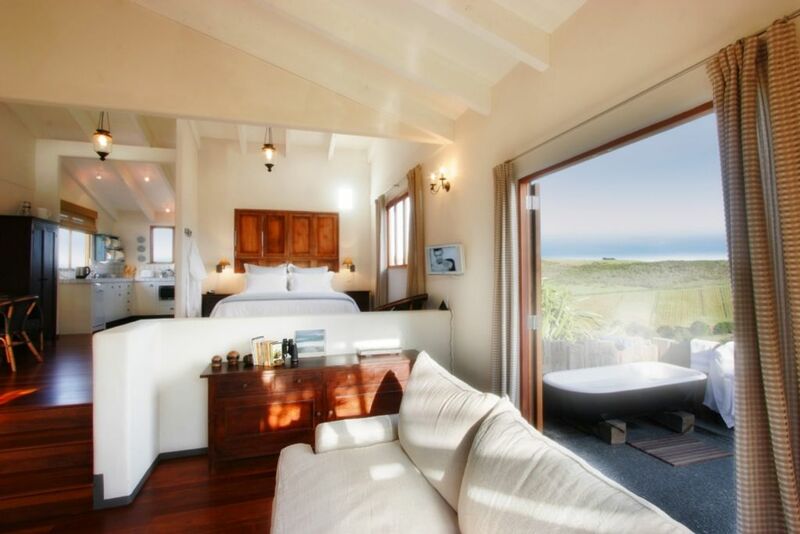 The property shares boundaries with several award winning vineyards and restaurants including Miro/Casita Miro, Stonyridge, Te Motu and Obsidian…making spectacular wine and food a short stroll away. A 10-minute walk down the hill leads to picturesque Onetangi beach with it’s 2.5 kilometers of white sand and a further 10-minutes down the beach leads to the local pub. The following facilities are provided complimentary to all guests at The Loft: A full (self catered) breakfast, premium quality linens, exit cleaning, Wifi, Flat screen TV, Satellite TV/Freeview, DVD player and selection of DVDs, Ipod doc, Fully equipped kitchen, Luxury cotton towels and bathrobes, Handmade Waiheke soaps, Shampoo and conditioner, Hairdryer, Iron and ironing board. A vehicle is available with this property. Please enquire for rates and conditions. 3 night minimum Dec 20 - Jan 10; 3 night minimum Easter and Anniversary weekends; 2 night minimum all other times. The perfect romantic getaway for two!